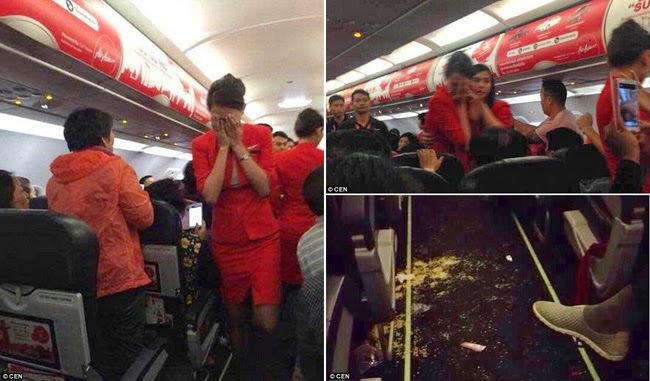 A Chinese woman aboard a Thai AirAsia flight had thrown hot water and noodles right at the face of a flight attendant after she was allegedly sited far from her boyfriend on December 12, 2014. The incident had circulated through various social media leading Chinese Government to remind Chinese tourists to behave in other countries. The flight en route to Nanjing, China was only 90 minutes away to their destination but the pilot opted to return to Bangkok while the flight crew gave first aid to the scalded flight attendant. As it turned out, the woman was already unhappy before the flight took off because she was not sited beside what many believed to be her boyfriend. The flight crew took the initiative to asked other passengers to change sits to accommodate the woman’s preference to be sited beside her boyfriend. After sitting together, the alleged couple got into a heated discussion and suddenly the woman splashed a cup of hot noodles to the face of a flight attendant. Other passengers were quick to take out their smartphone and grab the transpiring incident. The flight attendant covered her face and shouted in pain. There was instant disorder in the flight and some say that the man even threatened to blow up the aircraft. Later, he said that the flight attendant was just scalded by accident. After the plane landed at the airport in Bangkok, the airline authorities escorted the woman and her friends to leave the plane. It was reported that the airline and the group had reached an agreement and went aboard another flight back to China. The group was fined 50,000 Thai baht (approximately P67,000) while the woman will pay additional 200 Thai baht (approximately P270). Due to the report of the incident and the captured photos that had already circulated in other countries the Chinese authorities promised to punish the Chinese group for giving Chinese tourists a bad reputation. China’s National Tourism Administration stated that the group had tainted the Chinese image. The group was reportedly blacklisted by provincial tourism association. This year, 2014, more than 100 million Chinese had traveled to other countries making them the most number of tourists abroad.